What Does a CNA Do in Nursing? Do you want to learn more about what a CNA does? A CNA, or certified nursing assistant, helps the registered nurse or licensed practice nurse on duty complete patient care tasks. In general, the role of a CNA is to help the patient manage daily tasks such as feeding, bathing, and dressing. Read on to learn more about what a CNA does, the training needed, and the salary and job outlook for this position. CNAs provide basic patient care that includes cleaning and dressing the patient; helping them to use the bathroom; repositioning patients in the bed when needed as well as transferring them between beds and wheelchairs; reporting to supervising nurses about any health concerns for the patient; measure patients’ vital signs; and feeding them meals. In some states, licensed CNAs can administer medication in addition to these duties. In a nursing home setting, the CNA is often a patient’s primary caregiver. Approximately 42 percent of CNAs work in nursing homes; 26 percent in hospitals; and 4 percent in home health services. Because lifting and moving patients is required, it’s important for CNAs to be in good physical condition. Most people in this role work full time, and because of the need for round-the-clock care, night and weekend shifts are often required. 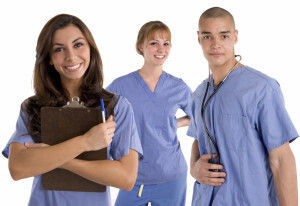 Nursing assistants must complete a training program that often lasts from three to six months. These programs are offered in high school vocational programs, through community colleges, and at a variety of nonprofit organizations. The Red Cross website has a list of their CNA training programs. Upon completing the CNA training, you must take a competency exam in order to become certified. This exam is typically administered by the state board of nursing and varies from state to state. Some states also require CNAs to complete a certain number of continuing education hours each year. According to the U.S. Bureau of Labor Statistics, the average annual CNA salary is $24,420. CNAs who go on to earn additional certification, such as the certified medical assistant credential, are able to advance in the nursing field and make a higher salary. The need for CNAs is growing quickly in the United States, with 21 percent growth in this field projected by 2022. This means that there will be 312,200 new jobs created for CNAs over the next ten years. If you are a compassionate person who enjoys helping others, and is looking for a high demand job with low educational requirements and investment, you may want to consider becoming a certified nursing assistant. To learn more about what a CNA does, you may want to consider volunteering at a nursing home or at a hospital to get a feel for what you’ll be required to do in this important role.